Supermoon? Or Just Another Perigee Syzygy? The moon’s orbit is not circular. According to Wikipedia, the moon is closest at around 357,000 kilometers and farthest at 406,000: a difference of something like 13%. That’s a freakishly egg-shaped orbit compared to the earth’s orbit around the sun, for instance. And it moves between these extremes every month. Tonight, the perigee (the close approach) corresponds with a full moon (a syzygy — when the earth, moon, and sun are all in a line). What does that mean? A brighter-than-average full moon! If you were around for the last “supermoon” in 2011, you’ll have heard that it was the closest/brightest since 1992, or something. Well, this one’s brighter. But don’t freak out if the clouds are hanging in the sky wherever you live; there’s a perigee full moon every 411.8 days, and there’s going to be one next year too. Unless you’re taking repeated photographs with the same lens, you won’t be able to detect the size difference with your current wetware anyway, due to the aptly named moon illusion. You already perceive the moon varying in size by a factor of 1.5 when it’s on the horizon versus hanging overhead, so an extra few percent is going to be lost in the noise floor. And the difference between a hazy and clear night will easily swamp the difference in brightness. 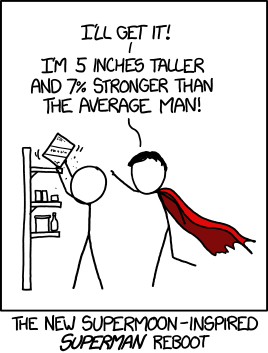 As usual, XKCD sums it up nicely. The “supermoon” is a perigee when the moon happens to be full. It’s a fairly frequent event, by celestial standards, and it’s underwhelming. If you want to see something really freaky, keep your eyes peeled for the total eclipse of the sun in August 2017. Don’t get us wrong, we think that the moon is super! And there’s nothing wrong with going outside to have a peek at it. Just please, during this year’s perigee syzygy, spare us the hyperbole. “Supermoon” versus “micromoon” comparison image courtesy [Stephan Sciarpetti].